US Patent Application # 2009/0300958 "Cake Decorating Memento"
Through the twentieth century, measures of national income and then gross domestic product (GDP) were the means by which countries came to know and assess themselves. In the twenty-first century, we are offered an alternative: gross national happiness. 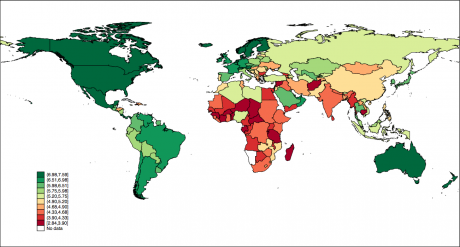 Massive surveys like the Gallup World Poll offer global maps of affect and desire (Figure 1), and governments seek interventions that provide cost-effective uplift in their national tally. Where the old behaviorism posited that individuals are known by their responses, the new science of happiness judges nations and continents on the basis of numerical happiness indices. But what is gained and what is lost in moving from a financial to an affective economy? Does it, as its advocates argue, signal a new kind of politics: data-fueled, evidence-based, more humane? Figure 1: Average Cantril’s Ladder scores over the period 2012–2014 (from Helliwell et al. 2015:20). Please imagine a ladder with steps numbered from 0 at the bottom to 10 at the top. Suppose we say that the top of the ladder represents the best possible life for you and the bottom of the ladder represents the worst possible life for you. If the top step is 10 and the bottom step is 0, on which step of the ladder do you feel you personally stand at the present time? (Gallup 2015). This question is known as “Cantril’s Ladder,” named after the social scientist Hadley Cantril, who developed and used it on a grand scale in surveys conducted in the mid-1960s. 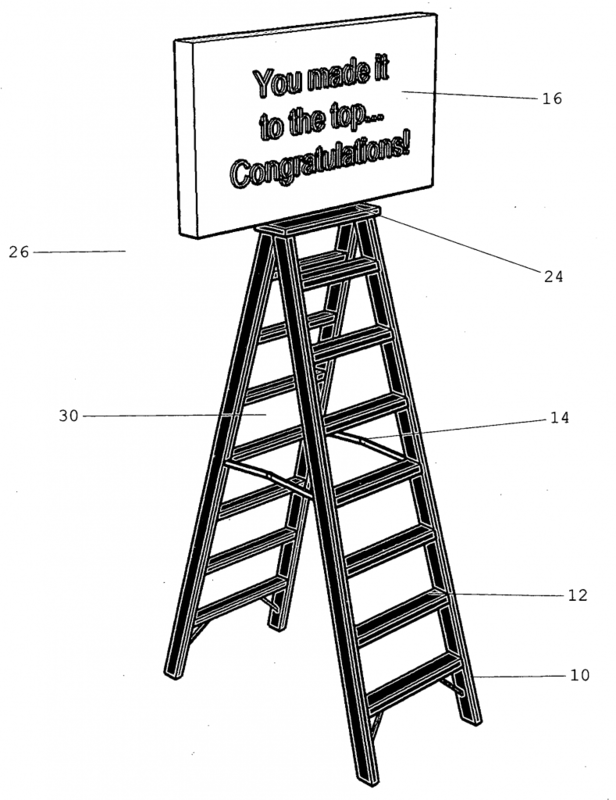 The Ladder’s most obvious feature—its simplicity—has seemed to many to be a serious flaw: its assumptions have been questioned, its phrasing refined, and other variants have been added, in which participants are asked to think forward into the future, to evaluate their lives in the round, to rank their anxiety against their contentment. Seen from another angle, however, simplicity is a virtue: no other measure of subjective wellbeing has been so widely used in a more or less stable form over such a long period of time. Cantril’s Ladder provides single, numerical data points. And it has a ring of authenticity, of old wisdom. Just as Cantril intended, its assumptions are concealed beneath a deferral to the individual of whom it is asked. But of course happiness studies do not in fact tell us anything about individual people. Nor does any single survey tell us very much either. Instead, meaning is conferred to large numbers of responses to Cantril’s Ladder by studying fluctuations over time. Although happiness—under the banner of “subjective wellbeing”—is cast as an alternative to economic measures of national health, it is in fact only a refinement of economics as a practical science. The findings from happiness data that have attracted the most attention generally concern long-term correlations between traditional statistics like GDP and the newer emotional indices. Take the Easterlin Paradox, for instance, which states that although average income is positively correlated with happiness, changes in average income over time do not result in changes in happiness (Easterlin 1974). Easterlin’s finding and the numerous studies that have followed rely on longitudinal happiness data from surveys using Cantril’s Ladder. Up to the present day, the various data sets using the Ladder together form a temporal archive of international happiness spanning the period from the height of the Cold War to the middle of the War on Terror, via numerous economic booms and busts. This is a resource for understanding national and global trends important enough to have helped secure the 2015 Nobel Prize in economics for its most able interpreter, Angus Deaton. the distinctive features of each country’s culture and ideals with view to promoting within each nation sympathy and respect for the ideals and aspirations of the others, and a just appreciation of their problems (quoted in Rangil 2011:23). Yet like so many mid-century projects in the social sciences, acknowledgment of cultural diversity was bound up with the search for human universals (see Bangham, Laemmli, and Kaplan in this issue). Recording cultural difference—increasingly an end in itself for UNESCO—was for Cantril only a means with which to establish commonalities that would bind people not just to their cultural or socioeconomic grouping, but to the mass of mankind. On the one hand, Cantril complained that “cultural apologists… in their search for differences between ‘cultures’ and uniformities within a single ‘culture,’ tend by and large to gloss over or explain away the individual differences which discerning readers of their own works can pick out’ (Cantril 1947:21). On the other, the project of mollifying “tensions” would be superseded when social scientists moved to “a different, a ‘higher,’ order of accounting which must include man’s desire to develop” (Cantril 1949:365). Both of these problems—of capturing the wishes of individuals while moving to a “higher order of accounting”—could be solved, thought Cantril, if information could be gathered, stored and made accessible in just the right way. Cantril worked on two fronts to solve the riddle of the individual and the masses. The first was the establishment of a clearing house of social survey data, the Office of Public Opinion Research, whose findings were published in a bafflingly comprehensive tome in 1951 (Figure 2). Figure 2. 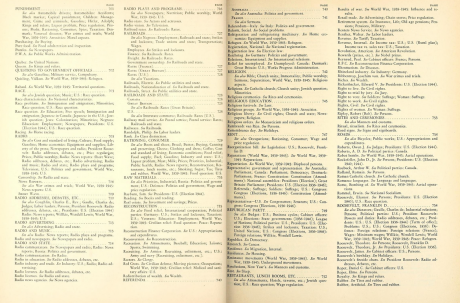 “Punishment” to “Rubber, Artificial” in the index of Public Opinion 1935–1946 (Cantril 1951). Cantril’s second major project began in 1955, when he and his collaborator Lloyd Free founded the Institute for International Social Research with a huge grant administered by the Rockefeller Foundation, but in fact provided by the CIA (Simpson 1994). Over the next decade, Cantril and Free collected data from around the world using the “self-anchoring scale” that would come to be known as Cantril’s Ladder. If the Office of Public Opinion Research was of interest to, as Cantril put it, “historians, sociologists, political scientists, economists, editors, policy makers, businessmen, labor leaders, and host of others,” (Cantril 1951:v) then the data collected in Pattern of Human Concerns was more narrowly focused on the role of public opinion in statecraft. In essence, the Institute for International Social Research was a continuation of Cantril’s government work, which had begun on the eve of World War II and seen him occupy various roles in the Office of War Information, U.S. intelligence operations, and as an adviser to Eisenhower and Kennedy. 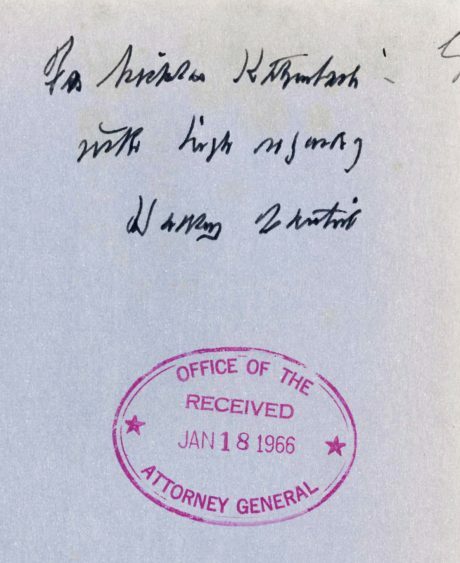 Indeed, the copy of Pattern of Human Concerns that I used in researching this essay is, appropriately enough, inscribed by Cantril to the Johnson-era Attorney General Nicholas Katzenbach (Figure 3). Figure 3. “For Nicholas Katzenbach / with kind regards / Hadley Cantril,” inscribed in a copy of Pattern of Human Concerns. Katzenbach was Attorney General and then Undersecretary of State in the Lyndon Johnson administration. In terms of survey technique, the use of the ladder question allowed Cantril to shift the burden of judgment wholesale onto the participants in his survey. Interviewees, in responding to Cantril’s Ladder, would bring the entirety of their lived experience to bear on the answer; the interviewer would add none of his or her own categories to the discussion. This would allow data collection on a vast scale while paying respect to “the point of view of individual participants” (Cantril 1965:7). But just as he handed out the work of judgment to participants in the survey, Cantril hoarded back the interpretative work for himself and his academic colleagues (not to mention his government contacts). To grasp the full force of what Cantril was proposing, consider the other kinds of inquiry into happiness that had been conducted before Pattern of Human Concerns. In 1938, for instance, the British social survey group Mass-Observation set out in to discover what this thing called “happiness” was. 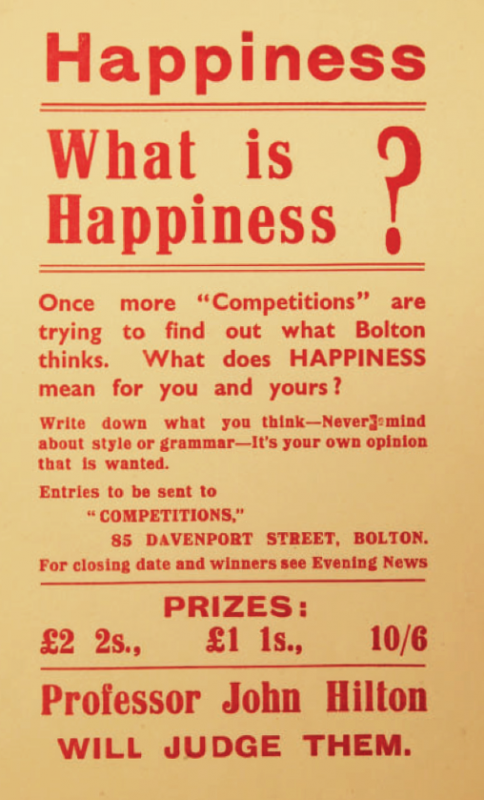 Working in the northern English town of Bolton, they enlisted the social scientist and local celebrity John Hilton as a “judge” and sent out a leaflet inviting definitions of happiness, literary talent notwithstanding (Figure 4). Figure 4. Leaflet advertising Mass-Observation’s happiness survey, 1938 (Mass-Observation Archive, University of Sussex, Topic Collection 7, Happiness 1c). Reproduced with permission of Curtis Brown Group Ltd, London on behalf of The Trustees of the Mass Observation Archive. The results were sometimes amusing, sometimes trite, sometimes strangely moving (“Happiness means to live content, to seek refinement rather than fashion, to be worthy, to think quietly, talk gently, act frankly, to listen to birds, to watch and study stars, to take interest in children”). But the survey was haphazard: it relied on the circulation of the leaflets and the will of the respondents. It was too discursive, inviting unquantifiable data. Tabulating the results was laborious because the categories had to be extracted from digressive prose; the happiness study was not repeated. Cantril’s own book Public Opinion 1935–1946 summarized other haphazard attempts to uncover the origins of happiness: in 1940, the American Institute for Public Research asked people to choose between “wealth, a happy home, or an interesting job” (68% wanted a happy home); in 1943, Fortune magazine asked young women across America whether “the next ten years of your life will be exciting ones, just average, or rather dull,” giving separate scores for “single women” and “opinions of unattractive women”; in 1946, Canadians were asked whether they would rather live “in the present” (57%), “100 years from now” (13%), in the “Gay Nineties” (12%), or in a range of other eras going back to the “time of Christ” (3%) (Cantril 1951:280–281). While Mass-Observation’s 1938 happiness survey shows how hard it is truly to ask people what they want, the subsequent surveys Cantril cited compare very unfavorably with the elegant technique of Pattern of Human Concerns. For all its ingenuity, the deployment of Cantril’s Ladder in the field was by no means straightforward. It turns out, for instance, that the idea of climbing a ladder has different connotations to different people in different places (aspiration versus labor, mundane versus exciting). Hence, in some cases Cantril’s Ladder has become Cantril’s Mountain (though, to mix metaphors even further, climbing a mountain is not everyone’s cup of tea). Far more problematic even than this, the Anglophone concept of “happiness” itself has no obvious equivalent in many languages. A partial solution was suggested by Cantril himself, who insisted that the ladder be presented as a visual cue throughout each interview and instructed interviewers to ask the question “moving finger rapidly up and down ladder” (Figure 5). But even if this solves the problem of translation, it doesn’t necessarily address the underlying conceptual mistake in assuming something as hard to define as happiness might have a common meaning throughout the world. Figure 5. Cantril’s Ladder, as illustrated in Pattern of Human Concerns (Cantril 1965:22–23). Beyond Cantril’s own work, difficulties of standardization come into play. The build-up to the question, the kind of person employed to ask it, and the context in which it is asked have all shifted from survey to survey. Sometimes both ladder and mountain disappear completely and a simple ranking of happiness from 0 to 10 is used instead. The culturally loaded implication of striving and climbing, not to mention the idea of “complete satisfaction,” are almost too obviously problematic to point out. And what of the assumptions involved in conducting survey work per se? These were known to cause problems right from the start, with one early commentator pointing out that “an educated urban man asking questions” was hardly an everyday phenomenon in many parts of the world. In some countries, interviewers were thought to be covert agents working for the government and were attacked; in Panama and Nigeria, some interviewers were arrested (Zubaida 1967:212). For Cantril these were simply obstacles, but in reality they reflected deep suspicions that could lead to biased responses. Given that so many happiness studies are based on longitudinal data, it also suggests we should be weary of what the numbers conceal. Cantril’s Ladder may appear simple, but the data have built into them the mundane, changeable, and even violent circumstances of their origin. Over the last 50 years, the problems with Cantril’s Ladder have been far outweighed by its archival fecundity. The simplicity and apparent neutrality of the technique have guaranteed its reuse, boosted by temporal studies like Easterlin’s, which uncovered the income/happiness “paradox.” The historicity of happiness data has led, just as Cantril anticipated, to a profound confidence in the combination of economic and social data, even as the latter purports to supplant the former in the guise of gross national happiness. In addition to this doubling-down of economic authority, there is a more subtle consequence of using data gathered with Cantril’s Ladder. The way ladder scores have been used equates individual and collective (typically national) fortunes. The more successful this identification, the weaker happiness data is in helping policymakers distinguish between alternative paths. For instance, employment tends to come up as an important factor in happiness, so a policy of full employment seems justified, but this says nothing about wages, and so in the United Kingdom the government has pursued schemes that allow companies to circumvent the minimum wage. The cynical view is that we are moving from a politics of collective bargaining and social welfare to one of malign policy enacted on the basis of cherry-picked data purporting to represent our innermost desires (Hayward 2012). In economic terms, “balancing the books” is said to be the same for a nation as it is for a household, and so state services and local councils are dismantled with the stated aim of reducing the national deficit, the underlying aim being to boost the private sector. The “happiness industry,” as William Davies has recently called it, practices the same sleight of hand in linking personal reports to national fortune (Davies 2015). Cantril would have been fascinated by these developments; it was part of his program, after all, not only to discover human universals but to sell the idea of a highly aspirational, internationally uniform identity to the masses. If the project of measuring happiness were to become pervasive, then a standard of global aspiration would emerge, bringing people from diverse backgrounds together into a worldwide struggle for a single brand of well-lived life. Speculative as this sounds, there is evidence that Cantril’s vision has come to pass. In a paper cited enthusiastically by the Nobel committee, Angus Deaton argues that “when asked to imagine the best and worst possible lives for themselves, points 10 and 0 on the scale, people use a global standard. Danes understand how bad life is in Togo [which typically scores lowest in happiness surveys]…and the Togolese, through television and newspapers, understand how good life is in Denmark or other high-income countries” (Deaton 2008:69–70). The strange simplicity of Cantril’s Ladder, the pattern of its deployment, and the interpretation of its results have brought social science, economics, and governance into close alignment. Far from displacing older economic measures, gross national happiness brings economics to bear on attitudes, on aspirations, on subjective states. The logic of totality and the power of a temporal archive have broken down the classic sociological distinction between individual and collective, and all by way of a single question. Cantril, Hadley. 1947. “The Place of Personality in Social Psychology.” Journal of Psychology 24:19–56. ———. 1949. “Toward a Scientific Morality.” Journal of Psychology 27:363–376. ———. 1951. Public Opinion 1935–1946. Princeton, NJ: Princeton University Press. ———. 1965. The Pattern of Human Concerns. New Brunswick, NJ: Rutgers University Press. Davies, William. 2015. The Happiness Industry: How the Government and Big Business Sold Us Well-Being. New York: Verso Books. Deaton, Angus. 2008. “Income, Health, and Well-Being around the World: Evidence from the Gallup World Poll.” The Journal of Economic Perspectives 22(2):53–72. Easterlin, Richard. 1974. “Does Economic Growth Improve the Human Lot? Some Empirical Evidence.” In Nations and Households in Economic Growth: Essays in Honor of Moses Abramovitz, edited by Paul A. David and Melvin W. Reder (pp. 89–125). New York: Academic Press, Inc.
Gallup. 2015. “Understanding how Gallup Uses the Cantril Scale.” Available at link. Hayward, Rhodri. 2012. “The Politics of Happiness.” The History of Emotions Blog, Queen Mary University of London, Centre for the History of Emotions. Available at link. Helliwell, John, Layard, Richard, and Sachs, Jeffrey, editors. 2015. The World Happiness Report 2015. Available at link. Rangil, Teresa. 2011. The Politics of Neutrality: UNESCO’s Social Science Department, 1946–1956. Durham, NC: Duke University Center for Political Economy. Simpson, Christopher. 1994. The Science of Coercion: Communication Research and Psychological Warfare 1945–1960. Oxford, UK: Oxford University Press. Zubaida, S. D. 1967. “Review of The Pattern of Human Concerns.” The British Journal of Sociology 18:212.